‘Tis the season for spectacular displays of holiday lights! 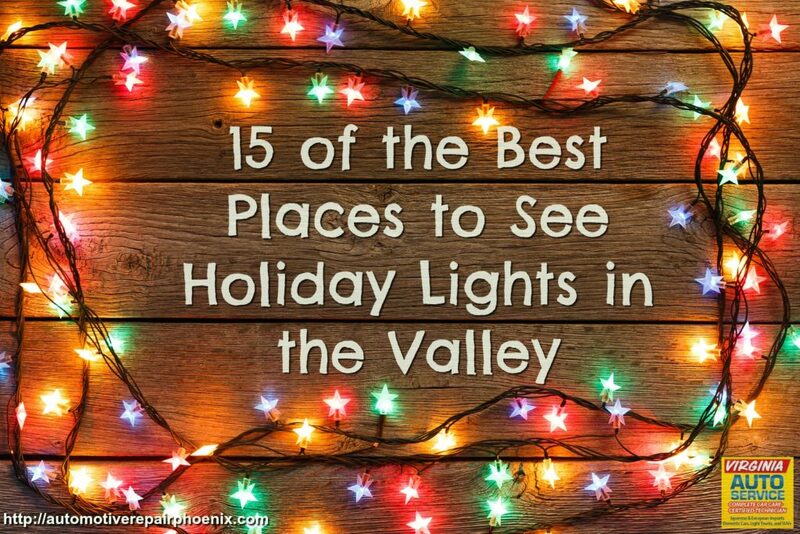 Now that Thanksgiving has passed, cheerful displays of holiday lights will be going up across the Valley. From now through part of January, houses, businesses, and popular Valley attractions -like the Phoenix Zoo- will be lighting up the night in festive fashion. We have gathered a list of 15 light displays- from neighborhoods to fantastic events- in and near Phoenix for your family to enjoy. Pre-Parade Activities: Head over to the North Phoenix Baptist Church (5757 N Central Ave, Phoenix, AZ 85012) on Friday, December 2 from 6 p.m. to 9 p.m. for fun pre-parade activities. Attendees can get an up close and personal view of many of the parade floats, and partake in judging of the floats. A free family event that includes face painting, arts and crafts, small games and a photo with Santa. Each activity area will highlight a different holiday tradition from around the world. Hosted by the students of Arizona State University’s Recreation Management program. Witness the resort transform into an enchanting winter wonderland -with three million lights, a desert ice skating rink, and Santa’s secret headquarters- during its Seventh Annual Christmas at the Princess festival now through January 1. The Princess is the perfect destination to create holiday traditions and make holiday memories your family will cherish for years to come. Prices and times vary. This light show benefits Make A Wish Foundation. Last year, the neighborhood won ABC’s The Great Christmas Light Fight for the most impressive holiday light display across the nation. Enjoy a 13 House Computer Animated Christmas Light Display. There are over 110,000 lights, 300+ strobe lights, and over 50,000 ft. of wire. Tune into 93.9FM to listen to the music while you watch the lights dance. It’s located near Elliot and Higley roads in Gilbert. Runs from December 1- 30, Monday through Thursday from 6 p.m.-10 p.m. and Friday through Sunday 6 p.m. – 10:30 p.m. Viewing the lights is free, donations for the Make A Wish Foundation are accepted. The event kicks off at 4:30 p.m. on December 10th with live music, selfies with Santa, food trucks, face painters and more! Head out early, get your spot, a bite to eat and listen to some great music while making new friends with your neighbors. The Boat Parade will feature as many as 50 festively lighted boats of all sizes. After dark, more than a thousand luminarias will illuminate the sidewalks and paths of Tempe Beach Park, a special display provided by Tempe South Rotary. The parade launches off at 7 p.m. with a colorful display of fireworks at its conclusion. Go early, stay late! Admission is free. From now through January 7, this stunning display of 1.5 million LED lights will illuminate sixteen blocks of Historic Downtown Glendale, making it the largest free holiday light display in Arizona. Lights are on nightly from 5-11 p.m. Every weekend includes scrumptious festival food, petting zoo, shopping in Historic Downtown and Catlin Court, gift and craft booths, kid’s inflatable rides, rock wall, bungee ride, mini pony carriage rides, pony rides, face painting, visits with Santa, and more. Each weekend has special attractions based on their themes. Historic Downtown Glendale is located at 58th and Glendale avenues. For December weekends (Dec. 2-3, 9-10 and 16-17) free parking is available throughout the downtown area. Take a ride on the Paradise & Pacific Railroad through a winter wonderland of lights and displays. Opening night festivities on December 9 include live music, a tree lighting ceremony and a visit from Santa, who is at the park nightly through December 23. Train rides on the Paradise & Pacific Railroad are $4 and rides on the Charros Carousel are $2. Children two and under ride free with a paying adult. 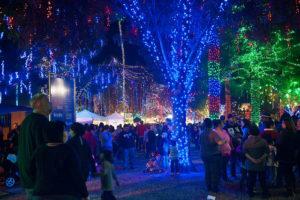 The park’s event runs from December 9 through January 1, from 6:30-9 p.m. nightly. Entry is free. 7301 E. Indian Bend Rd., Scottsdale. Eight thousand hand-lit luminaria bags and thousands of white lights brighten the Desert Botanical Gardens now through December 31. Open nightly from 5:30 p.m. to 9:30 p.m. Admission is $30 for adults, $12.50 for children ages 3-12. Children under 3 admitted free. The international lantern arts festival is at Rawhide at Wild Horse Pass Casino and combines age-old Chinese lantern festivals with modern technology and lights to create 11 exhibits and 75 displays. The Lights of the World lantern displays extend from 18 to 60 feet, showcasing features of different cultures and civilizations around the globe. There’s also carnival rides, performances, music and food. The event runs now through January 29. Hours vary depending on the day, visit their website for details. Admission varies by age. Visit the Mesa’s nearly 4-story tall Christmas Tree on Macdonald Street and visit Santa on select days. Start (or end) your journey down Merry Main Street at the Jack Frost’s Food Truck, a great place to gather for a bite of something delicious or a sip of something warm. Go ice skating on the more than 4,000 square foot outdoor ice skating rink. Enjoy Holiday Happenings concerts at the Mesa Arts Center. And so much more! The event runs now through January 1. Free entry; $10 for one hour of ice skating; Price varies for other activities. 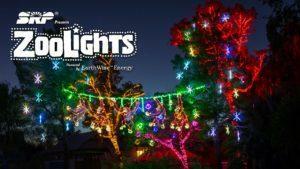 Join the Phoenix Zoo at the Valley’s brightest holiday tradition: ZooLights presented by SRP! Celebrating 25 years, ZooLights shines with millions of lights, a three-story-high holiday tree, hundreds of glimmering lights displays and lakeside music-in-motion shows. ZooLights is open to the public now through Sunday, January 8. You won’t get to see many animals — few of the animal enclosures contains lights — however, Jengo the Talking Giraffe and Tortuga the Talking Tortoise will be available for entertainment. ZooLights is open 5:30 – 10:30 p.m. nightly. Prices vary by date. Zoo members get discounted admission. This year marks the 60th Tumbleweed Tree built in Downtown Chandler. On December 3, celebrate a unique Southwestern tradition that draws visitors from far and wide during the holidays. 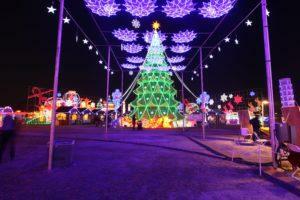 The Parade of Lights and Tumbleweed Tree Lighting will take place in downtown Chandler, Arizona at Dr. A.J. Chandler Park. Festivities begin at 4:30 p.m. and end at 9 p.m. Bring your camera for a picture with Santa! The parade starts at 7 p.m. The tree lighting follows the parade. The event is free; however, some activities may require a little money. 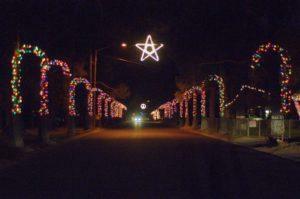 This is only a small bit of the exciting holiday fun you can find in the Valley this holiday season. We hope that this list may help you make a lasting memory with friends and/or family this year.